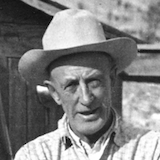 Harry Arthur Gant lived at the intersection of the Old West and the New West. Harry Arthur Gant lived at the intersection of the Old West and the New West. He was a cowboy in Colorado during the 1890s and a silent-film cameraman in Hollywood. He tells his story with a distinctive mix of Old West plain speaking and New West sophistication, with the rough edges left on. This memoir spans two of the most fascinating parts of America's past. Harry Gant wrote his memoir in 1959. It gathered dust for fifty years before his grand-daughter and her son brought it to Castle Knob. It's a remarkable glimpse into the ways of the Old West, the early days of the film industry, and the mind of a real character. Just as remarkable are the traces of Gant and his friends that remain in the corners of the Internet. While checking his facts, Castle Knob found an entire chapter omitted from his memoir, a chapter that puts him at the center of one of the great stories of the Twentieth Century.